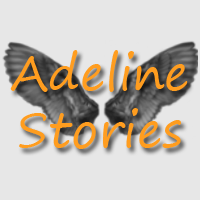 Adeline made her way back, lost in thought about the events that had just unfolded a few days before. She didn't know how she'd explain it to everyone, or even if she properly could explain it, but with nowhere else to go and her former company deceased there was little to do save return to the company and hope they wouldn't consider her a traitor for surviving. The city was a few days out, and she took her time. Normally Adeline felt like she was carrying practically nothing, but now the saddle bags strapped to her lower body felt heavy. Guilt and grief weighed everything down, it seemed, and even when she stopped for the night she barely slept as nightmares haunted every minute she closed her eyes. By the time she padded her way into the city Adeline looked as bad as she felt, eyes on the ground and shoulders slumped so her hair hung in her face and hopefully hid most of the dark circles. Once she had passed the gate it was a simple matter of letting herself go down the familiar path to the old weapons shop, pushing the door open and ducking to not smack her head on the doorway and giving a passive wave to the tiefling woman behind the counter as she kept walking to the other side of the store and through a beaded curtain at the back. Through one more door, then down a ramp next to some stairs that had actually been put in for her so she could get around easier. The door at the bottom was shut, as always, and Adeline reached out before knocking the pattern that was just so automatic to her. Only then did she lift her head, looking at the little slot in the door as it slid back. "Addy! Hold on, I'll open the door." The eyes that stared out at her were familiar, as was the voice, and Adeline took a step back to let them slide back the bolt and swing the door inward to let her in. Once again she had to duck, too tall to fit otherwise, and she made her way over to a small corner where there was simply a pile of hay instead of one of the many beds scattered through the small cave that she had entered. "Addy? You okay?" A halfling woman had opened the door for her, and now that it was shut again she walked over and sat down next to the tigertaur with her legs crossed. "No." Adeline managed, laying on her side and just staring off into nothing for a while. "Okay. Let me know when you're feeling better. I'll be here." The halfling picked herself up, going back to her duty at the door and leaving Adeline alone. Eventually Adeline knew she'd have to get up, but for now she just wanted to inhale the familiar scents of her bed and her home, and try to hold on whatever sanity she had left now that she was safe. That had been her only thought up to that point, get to safety and then fall apart. Even if she couldn't quite cry or scream or do anything like that, she could begin to process what she'd been through and that was enough for now. All other bits are copyright their original owners.